This event has reached capacity. A waitlist has been created. EBC will inform you if space opens up. Please join the EBC Ascending Professionals Committee and the Young Professionals in Energy (YPE) Boston Chapter for a tour of the ISO New England Master Control Center located in Holyoke, MA this Spring of 2019! ISO New England is the independent, not-for-profit organization authorized by the Federal Energy Regulatory Commission to oversee the day-to-day operation of New England’s electric power generation and transmission system, administer the region’s competitive wholesale electricity markets, and manage comprehensive regional power system planning. The tour will include an overview of ISO New England and its three critical roles, as well as an update on regional energy issues. 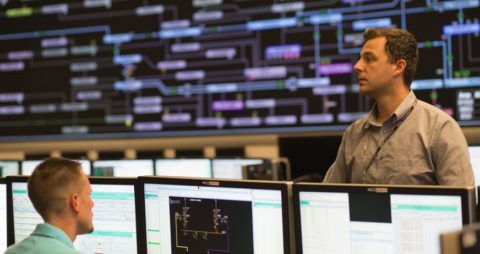 Attendees will also have an opportunity to view the ISO’s state-of-the-art master control center where the ISO’s certified system operators monitor, dispatch, and direct the flow of electricity across the power grid 24 hours a day, 365 days a year. Following the tour, an informal gathering will occur at a restaurant / brewery nearby. For more information, please contact Jackson Bailey, EBC Marketing & Program Manager, at jbailey@ebcne.org. Register early! Space is limited. This ISO New England tour will only accommodate 16 attendees. Tour: 3:00 p.m. – 5:00 p.m. Registration is free. As noted above, space is limited to 16 registrations. Please note: The name that you register with must match the name on your government issued ID. Your government issued ID will be required to enter the premises. Please keep in mind that online registration for this program will close at 5:00 p.m. on Thursday, April 25. Due to the high level of security at ISO New England, all visitors must be approved and added to the visitor list prior to their arrival. The ISO cannot accommodate visitors who arrive unannounced. Government-issued photo identification is required to enter the premises.